LUCY is available but is due to foal August 2013 sire being Caballo. “Sammy” – Katzam is STILL AVAILABLE BUT has a foal at foot (sire the Holsteiner Stallion Presario, a magnificent young stallion standing at Adlou Farm and who has Prestige, Littorio and Corlando blood). Also available is “Ginger” (Danebay) about to foal (August) again the sire is All NZ Caballo. Browse the broodmare selection. 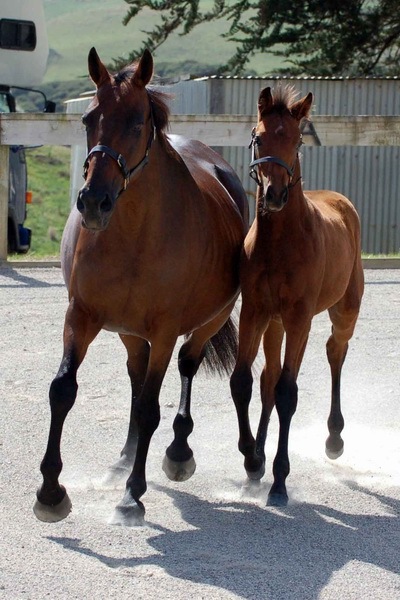 Hover over “horses for sale” above -“broodmares” and check out the various broodmares by name by clicking on the name or click the thumbnail pictures. The mare is performance tested and also classified by the Holsteiner Verband classifier to be amongst the best mares in Australasia. Our aim is to produce a sport horse with all the jumping and dressage qualities of the best Holsteiner but with extra speed and endurance of the New Zealand Thoroughbred particularly with eventing in mind.